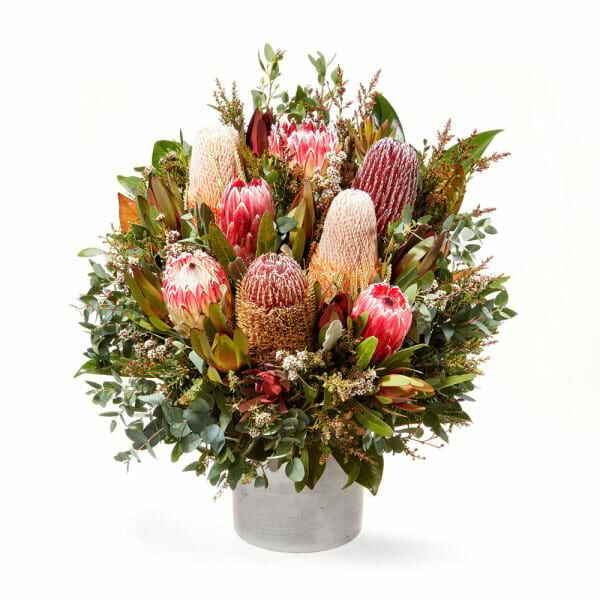 Our native flower arrangements and bouquets feature fresh stems of flora and fauna including favourites such as protea, banksia, wax flower, eucalyptus, and leucadendron. 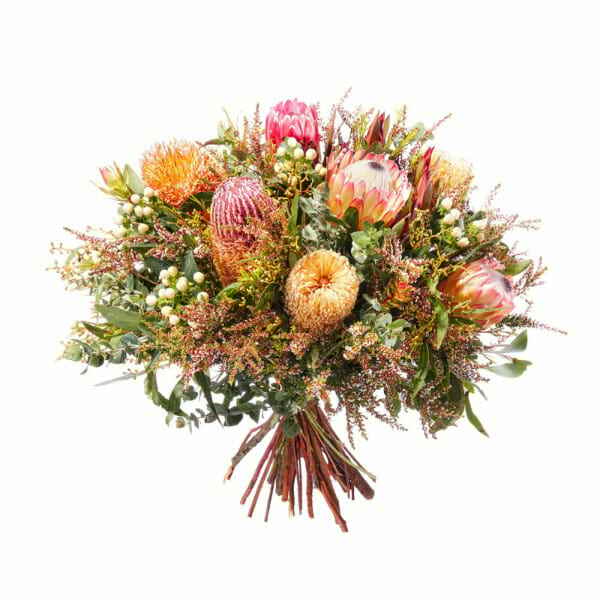 Throughout the year we also get to play with the likes of seasonal greats such as gorgeous grevillea, kangaroo paw, bright flowering gum and striking warratah. 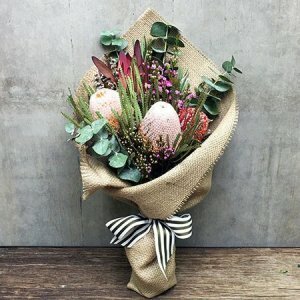 There is a fresh swing towards customers favouring Australian native flowers delivered over other flowers, and it`s easy to see why. First of all there is the value for money. 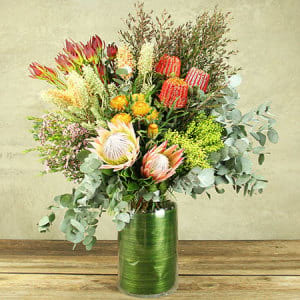 As these native beauties can last up to 4 weeks in a vase or arrangement (with some varieties even able to be naturally preserved and dried), you receive great value out of your flower purchase. 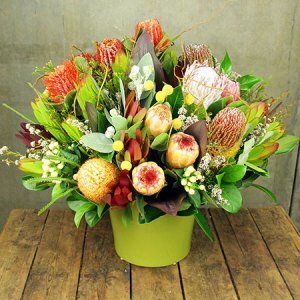 But the main reason why a native flower delivery is exceedingly popular is how they look. Their unusual shapes, textures and colours make bold statements in flower arrangements. The distinctive look of native flowers and foliages provides a depth and sophistication to any arrangement, while on the other, their exceedingly varied range of colours, textures and proportions ensures they will never become staid or predictable. 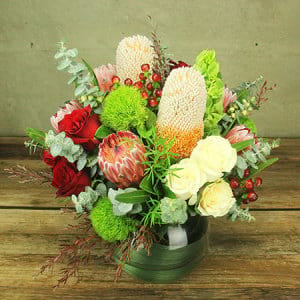 The team at Flowers for Everyone have designed a wide variety of Australian native flower arrangements for you to choose from. Select from fresh native flower designs in ceramic pots, native flower boxed arrangements, and bouquets of wildflowers and native blooms. 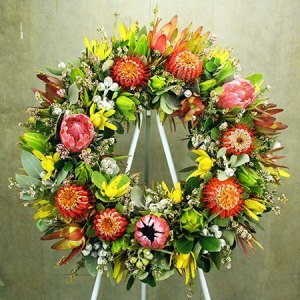 We even have a range of native sympathy flowers, funeral caskets and tribute wreaths available in our online flower shop. The Australian native gum flower, or Eucalypt, is one type of native flower which was famously the inspiration of May Gibbs` gumnut flowers characters, "Snuggle pot and Cuddle pie". Eucalyptus gum holds a distinctive fresh fragrance and looks perfect arranged on its own in a rustic vase, or styled casually throughout a native floral arrangement or a beautiful bouquet. 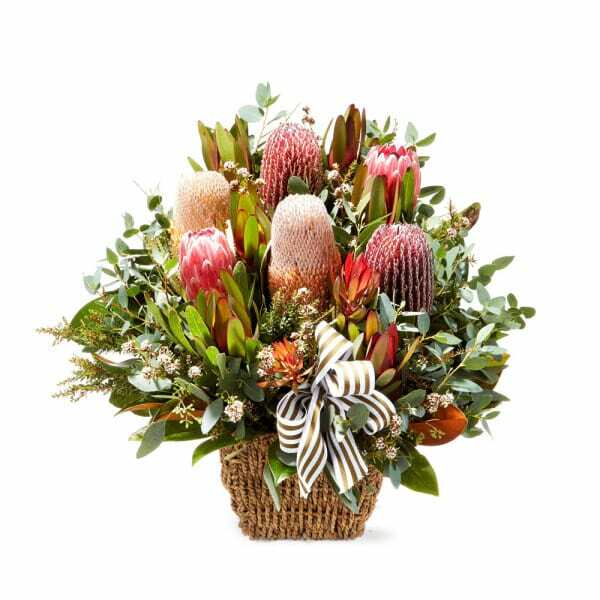 Another large family of flowering plants is the Proteaceae family, which is found largely in Australia, as well as the southern regions of Africa. Flowers from this family tend to be inflorescence, that is, many small flowers packed into a large head. 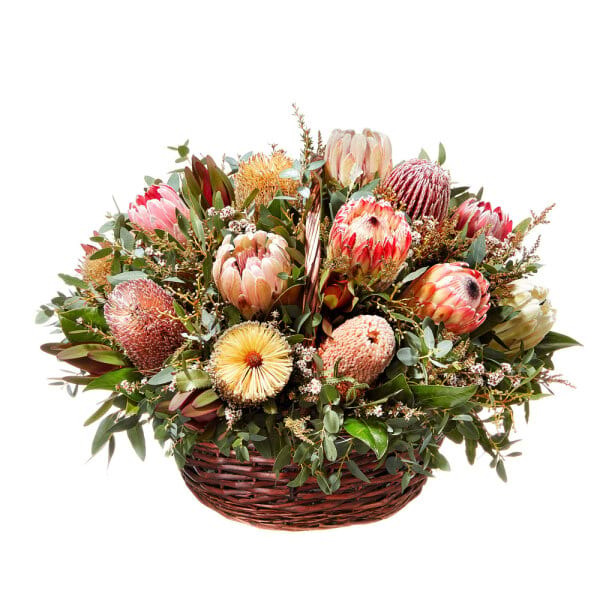 Protea come in a beautiful array of colours from pale pink through to deep burgundy-pink, some even with gorgeous chocolatey coloured centres. 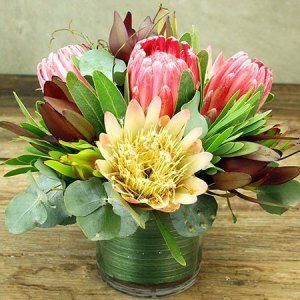 We particuarly love the King Protea, with its giant sized head in soft velvety silver and soft pink. 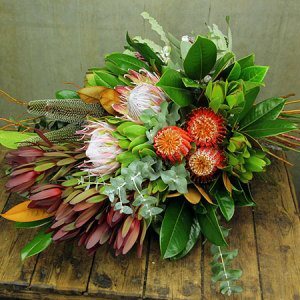 Just one stem of King Protea can create a dramatic imnpact in any native floral design. The Western Australian Kangaroo Paw is one of the most popular of Australian native flowers, and is a popular export also. There are 11 species of Kangaroo Paw. They are popular as cut flowers both because of their height and stunning colour range, not to mention their wonderful long vase life. 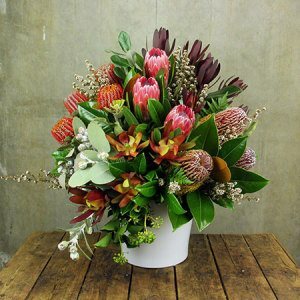 Kangaroo Paw looks absolutely fab casually mixed with a selection of proteas and eucalyptus gum, or just on its own en-masse in a tall vase. Our favourite colour kangaroo paw is the deep red and burnt orange varieties, as well as dusty pink which looks sweet in smaller flower posies. 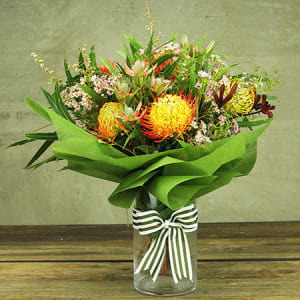 The Waratah (Telopea speciosissima), is the official floral emblem of the State of New South Wales, where our head office is located, so holds a special significance to us. 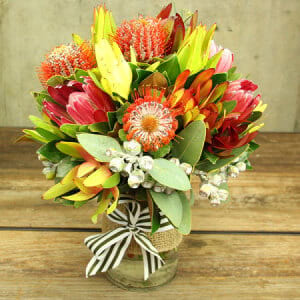 But the most important significance of the flower is that the name `Waratah` comes from the Eora people, the original inhabitants of the Sydney area. 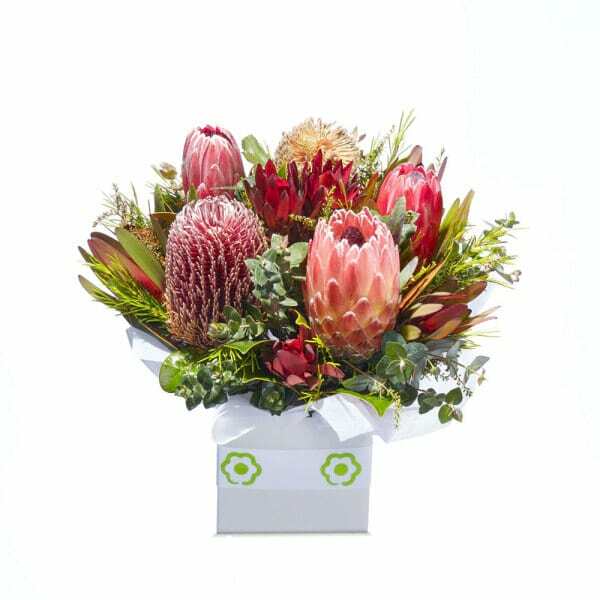 Watermelon red is the most common colour Waratah, but they are also available in white (popular with brides). Their season is short so enjoy them while they are in!